This document describes using and configuring an Iron Key on a Xubuntu Workstation. It explains the basics of a USB privacy key, describes how to initialize a new Iron Key on Xubuntu and provides scripts to allow you manage your Iron Key in a plug and play fashion. The added benefit of the Iron Key is that if Bob steals the physical key from Alice then Bob has 10 guesses at Alice's password and if he fails the device is locked forever. Iron Key's FAQ #7 claims additional benefits. The Iron Key does not cover the case that an attacker is already on your workstation while you are using it, i.e. if your key is decrypted I don't see why the attacker couldn't see it. 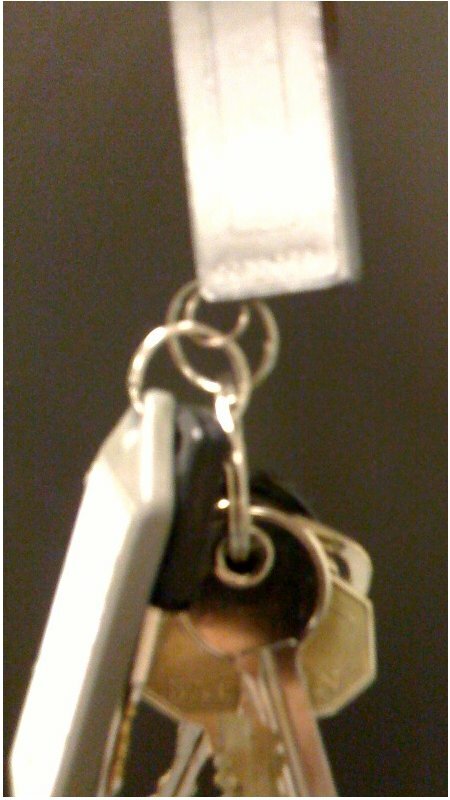 When attaching a USB Privacy Key to your key ring it's a good idea to use redundant rings. My Iron Key once came off in my pocket when I used only the small ring that it came with. I've since added an additional ring so that if it happens again to either ring, then the other ring will keep it attached as shown in Figure 2.
but they only run on Windows. On my Iron Key I've stored my id_rsa file that I use for key-based SSH access. I like to provide this file to ssh-agent directly from the Iron Key after I plug the Iron Key in and initialize it. I'll discuss an easy way to do this by starting or stopping the Iron Key with a script and modifying your .bashrc to start the ssh-agent if and only if the Iron Key is present. # Should be run with sudo. Tested on Xubuntu. # echo "ssh-agent not running, starting ssh-agent..."
From a FOSS user's point of view the Iron Key is simply an encrypted drive which is more physically rugged than most drives you could buy. It also has nice features to allow it to withstand a physical attack. You can easily configure it on a GNU/Linux workstation but other than that it's a USB drive. When it comes to managing your PGP or SSH keys there are no built in programs on the Iron Key unless you are using Windows.